For the majority of my active music absorbing career, I’ve felt like I’ve been playing catch up. I guess that’s what happen when you’ve got 40 or so years of rock and roll (not to mention blues, jazz, folk and whatever else you might eventually get interested in) with dozens and dozens of sub genres with their big hitmakers, indie darlings and one hit wonders. It’s a lot to take in and as a result I had a problem understanding how so many bands fed off of each other in a fairly short period of time to create all kinds of classics bands. 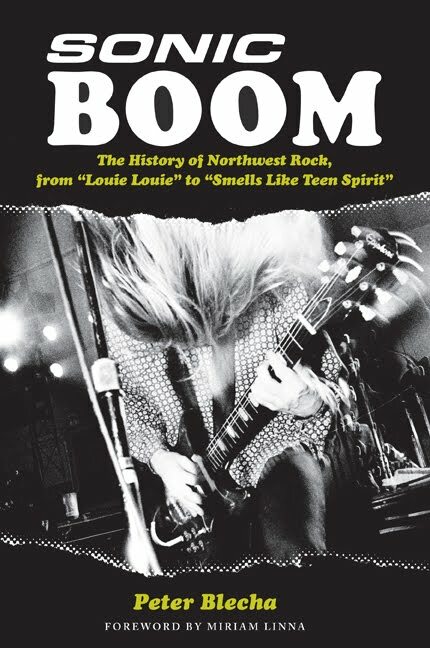 Peter Blecha’s Sonic Boom which came out earlier this year, does an amazing job of cataloguing all of that albeit in the specific area of Northwest America. Thanks to the cover, which features a shot of Mudhoney, I kind of figured Sonic Boom would be mostly about the grunge scene, but I couldn’t be more wrong. In fact, my one complaint about the book is that Blecha didn’t give this highly influential era comparably few pages. The section focusing on the intricacies of the scene from the late 50s through the 80s takes up roughly 229 pages while the 70s-90s get the remaining 50 pages. The funny thing is that it doesn’t come off as though Blecha dislikes that music, he just kind of breezes through it, which feels rushed after reading about bands you’ve never heard of like The Fleetwoods. But, like I said, this book really educated me on an era of rock and roll that I was mostly unfamiliar with and, better yet, and entire sub genre of music I didn’t know. I learned about bands like The Sonics, The Wailers, The Frantics, learned more about The Ventures (whose surf rock records blew me away when I stumbled upon my dad’s uncle’s discs when I first got my own record player for Christmas in high school) and Paul Revere and the Raiders. Plus there were just so many ins and outs to the scene that it played out like a soap opera more often than not. Plus, it’s fun to read about real life events that informed one of the all time best rock and roll movies That Thing You Do. One of the most fascinating aspects of the book was getting an understanding as to how different the record industry used to be. First off, records were sold regionally, so you might record a single on 45 and sell it in your area, but it might not do a anything anywhere else in the country. I’ve been saying for a while that it’s interesting to me that the music industry seems to be turning back to this single format that dominated the industry for so long. Now, we’re just buying them on iTunes instead of rolling down to the record store and picking up a record. Another aspect of the scene I found fascinating was the focus int he early to mid 60s of teen dances that would be held at school gyms or VFW halls put on by anyone who could rent the place out. I never experienced any dances like that in my day, but it sounds like local politics really got in the way. It made me think how cool it would be to open some kind of club that would foster young/new bands. You could record the live shows and put them out as a podcast. Then, considering how easy it is to record with Garage Band, start a little recording studio in the back and then just release them through iTunes. That would work right? Who wants to open a club? Anyway, I recommend Sonic Boom for any fans of rock who are looking for a detailed history before the Beatles came and changed everything (including focus on plenty of bands who influenced them and just about every other band that would come after). Like I said, it’s definitely light on the 90s grunge stuff, but if you’re in the mood, I highly recommend checking out a movie about that revolution called Hype. I haven’t seen it since high school (when I got into grunge, again, after the fact finishing my Nirvana CD collection, picking up Badmotorfinger to go along with Superunknown and giving TAD and Mudhoney a shot thanks to my beloved used record store Boogie). ← "Look, Another Girl Fight Season Finale"